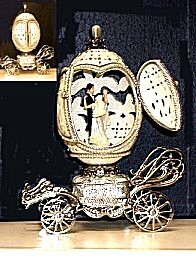 This lovely white jeweled coach plays the Mendelssohn's Wedding March. (Sorry the image reflects the color of the table but it is white) Two doors open to reveal a bride and groom that rotate when wound. The back of the egg is cut out (the black background is visible in the photo) so you can see them a bit from the back side.